Just after 2am UK time Luke Aikins, a Hollywood stuntman, stepped out of a plane 25,000 feet above the Simi Valley in California and plunged to earth without a parachute. Two minutes later his muscular frame barrel-rolled into a net just 100 feet square stretched between four cranes at the height of a 20-storey building. After an agonising pause in which Aikens appeared motionless in the billowing net, he was lowered to the ground and into the arms of his wife. 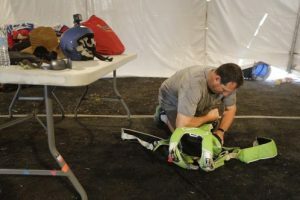 The 42-year-old reached speeds of 120mph with not even a wingsuit for comforting company, although he was afforded the luxury of an oxygen mask for the first 7,000 feet of the jump. 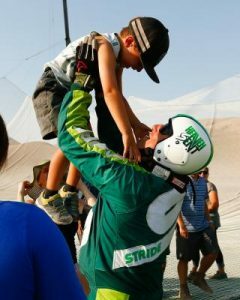 His death-defying stunt earns him a place in the record books as the first skydiver to successfully complete a jump without a parachute. There had been public outcry in the lead up to the jump when it was announced that the Screen Actors Guild would ban the televising of the stunt unless Aikins wore an emergency chute. Then, as tension mounted, the Guild dropped the demand and Aikins stepped out into the unknown. 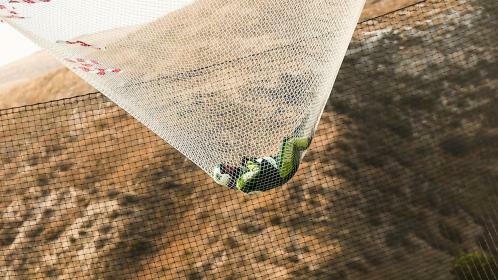 The daredevil skydiver admitted he wouldn’t have pulled trhe ripcord anyway. “I’m going all the way to the net, no question about it,” he said from the plane. The only guide his support team had came in the form of dummies of similar weight and size to Aikens that they dropped from a helicopter. Disconcertingly for the Ironman 3 stuntman one crashed straight through the netting but for his team and for Aikins practice made perfect. 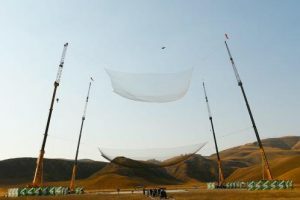 In the lead up to the event, the veteran of over 18,000 jumps practised by aiming for a smaller target of 28 feet square and opening his body to create a greater drag at an extremely low altitude of roughly 1,000 feet. The physics-defying stunt was put to him by two Hollywood public relations agents who thought it might grip a television hungry public. Chris Talley, who had worked with Aikins on other projects and helped train him for this one, recommended the skydiver to the two Amusement Park Entertainment executives. He told them Aikins was arguably the only guy not only good enough but also smart enough and careful enough to survive this. Talley was proved right as Aikins pulled off a perfect landing in an old movie ranch north of Los Angeles, where not that long ago Shia LaBeouf was battling Transformers. Now, thanks to the bravery and daredevil nature of Aikins, the dusty desolate section of desert will be forever remembered for a spectacle that had no need of CGI.